David Arthur Ault was born August 6, 1940 in Wenatchee, Chelan County, Washington and passed away unexpectedly on Monday, March 24, 2008 in Seattle, King County, Washington at the age of 67. He was the son of George Foster Ault of Edmonds and Ruth Genevieve Woodruff of Ritzville. He graduated from Seattle's Roosevelt High School in 1958 where he was active in Sea Explorers, swimming, and basketball. He did his undergraduate and graduate work at Western Washington State College (now University), receiving his Master of Arts degree in Mathematics in 1966. In 1970, he was granted his doctorate in Computer Science at Pennsylvania State University and then went on to teach in the East. He taught at Virginia Tech University in Blacksburg, Virginia before moving to San Diego and then returning to the Pacific Northwest. He was a member of the Institute of Electrical and Electronic Engineers and was Program Director of the Northwest Artificial Intelligence Group. A longtime activist in the gender-rights movement, he participated in trying to radify the Equal Rights Amendment (ERA) to the U.S. Constitution. He was especially active as a men's rights advocate in Men's Rights, Inc. which promoted equal rights for both men and women. A lover of Blue Grass music, he enjoyed attending festivals and was a member of the Puget Sound Traditional Jazz Society. His primary love was for genealogy and he was made an Honorary Life Member of the Seattle Genealogical Society for his many contributions to both SGS and the genealogical community in the Northwest. He chaired the Society's Computer Interest Group, the oldest in the United States, and was a leader in the Canadian Interest Group. He also co-chaired the Massachusetts, Connecticut, and Rhode Island State focus groups. His contributions to the genealogical community are too many to mention, but the Eastside Genealogical Society, of which he was also a member, the Fiske Genealogical Library, and the Sno-Isle Genealogical Society all will miss his willingness to help in any way he was needed. He was a popular lecturer throughout the Pacific Northwest. 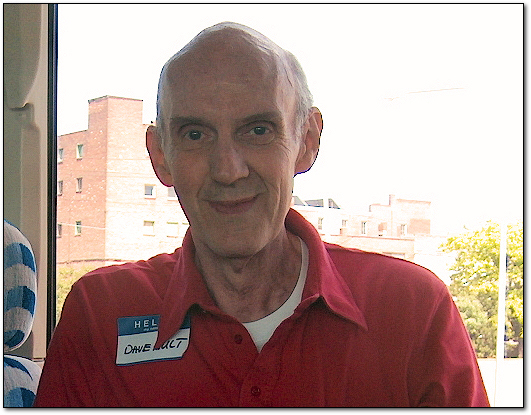 His computer skills endeared him to his friends and Dave was generous with his time and talents in helping the technologically-challenged. Many will miss their favorite "computer guru" who was known for his wit and wisdom. Dave never met a stranger; his welcoming ways warmed many meetings. He was always willing to lend his knowledge, expertise, and his computer equipment to whatever task was at hand; his kind spirit was always a addition to every meeting and event. He was an avid researcher on his many New England families and was currently studying the history of his ancestor, Stephen Hopkins, who came to Massachusetts on the Mayflower in 1620. He was actively researching the Matteson family. He was also of Irish and Scottish heritage and was a member of the Clans MacLachlan and Gunn. For many years, he participated in the Pacific Northwest Scottish Highland Games. He was also descended from Revolutionary War patriots as well as Loyalists who fled to Canada. In the past few years, he enjoyed traveling on research trips back to the Midwest and East and attending national family reunions.